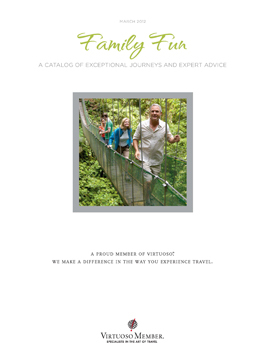 Please enjoy this digital edition of this Travel Catalog with our compliments. If you are not able to view this message please click here. when you’re having fun together! We’ve tallied up the playful giggles and totaled up the gleeful grins. And this new Travel Catalog is hereby declared a simply unbeatable collection of family fun vacations. Frolic your way to exotic ports aboard a fabulous ship. Cavort with wildlife on a far-flung, family-focused expedition. Play together in the warm waves of a beachside resort. And for all-out adventure, you’ll find nine exclusive VAST packages. Each page is loaded with reasons to smile. So let the fun begin! If you adore the idea of a no-hassle, details-handled, unpack-once vacation, check out this impressive collection of cruises, hotels and resorts. Round up your curious, active, fun-loving bunch and make merry on one of these magnificent expert-led safaris, western adventures or expedition voyages. You could win a spectacular cruise aboard Crystal Cruises® or $1,000 cash when you take the VIRTUOSO LIFE® Travel Dreams Survey. It only takes minutes! Bike an elephant path, cave tube with glow-worms, Zorb® New Zealand landscapes. Check out the Virtuoso travel advisors’ top picks for the newest and coolest family fun. with our compliments. Click on the cover to see inside. A culinary journey through Marrakech leaves no taste bud untickled. A photographer discovers the metropolis’ life after dark. You’ll find a menu of tasty vacation packages, scrumptious cruises and Advisor Tip tidbits in this Taste the World Travel Catalog. Exclusive extras and added amenities from your Virtuoso travel advisor are frosting on the cake! Peruse these pages for flavorful tours and tasty escapes. Head Down Under for a wildlife outing with a side of hiking and wine tasting. The inside scoop on hotels and resorts with amazing cuisines. Find your adventure of a lifetime in this issue of Virtuoso Insights. From refined ranches in Montana to hospitable cultural experiences in Kenya, there’s an abundance of options sure to entice even the most selective traveler. From Arizona to Montana, refined ranches in Cowboy Country. Friendship, philanthropy, and the call of the wild prevail in the cradle of humankind. Need a prescription to ease the stresses of everyday life? You’ll find rejuvenation and renewal in this Body & Soul Travel Catalog. From a California Wine Country retreat to a six-star voyage across Southeast Asia, you’ll find travel packages sure to bring you true bliss. Rejuvenating spa treatments in Los Cabos, and champagne toasts in New York City. Chill out in the warm Caribbean, lounge along the Italian Riviera, and find solace in South America. These villas combine the spacious-ness of a private residence with the personalized service of a hotel. Realize your artistic potential or discover a new talent while traveling! Peruse the pages of the latest Virtuoso Insights, the Haute Hotels and Enriching Journeys issue, to inspire your next getaway! From piano lessons to acting workshops, release your inner artist at sea. Learn to shoot like the pros on these photography-themed vacations. Celebrated designers ply their craft to the world’s most creative hotels. TRAVEL IS A GIFT we give ourselves and share with others. From resorts nestled among mountain peaks to stunning ships sailing the high seas, the following pages in the Enriching Pursuits Travel Catalog are filled with rare opportunities. On land or at sea, embark on a journey that piques your personal sense of discovery. Take off on an adventure to see wildlife in the Galápagos, pyramids in Egypt or bike across Southeast Asia. Choose to discover new destinations, and to protect and invest in delicate landscapes and cultures. PLEASE ENJOY THIS DIGITAL EDITION OF VIRTUOSO INSIGHTS WITH OUR COMPLIMENTS …click on the cover to see inside. Yearning for the Yangtze, desire the Danube? If river cruising tops your summer wish list then satisfy your cravings with one of these six remarkable river cruises, featured in the April/May issue of Virtuoso Insights. Our guide to keeping your kids happy at sea. Remarkable river cruises from the Amazon to the Yangtze. Experience the Mediterranean like a local on your next cruise. PLUS — Spotlight on San Diego! PLEASE ENJOY THIS DIGITAL EDITION OF VIRTUOSO LIFE WITH OUR COMPLIMENTS …click on the cover to see inside. Have the winter blues or cabin fever? Find your cure in the March issue of Virtuoso Life. Indulge in Island escapes to warm your spirit or plan a getaway to one of our favorite resorts. Take a look inside and contact me today. The country’s top travel advisors share where they’re sending their clients for the best beach getaways. Answering the summons to table on this Greek island is a memorable affair. Exploring a different kind of Italian idyll. Let the spirit move you. Tap into island healing at Hawaii’s top spas.